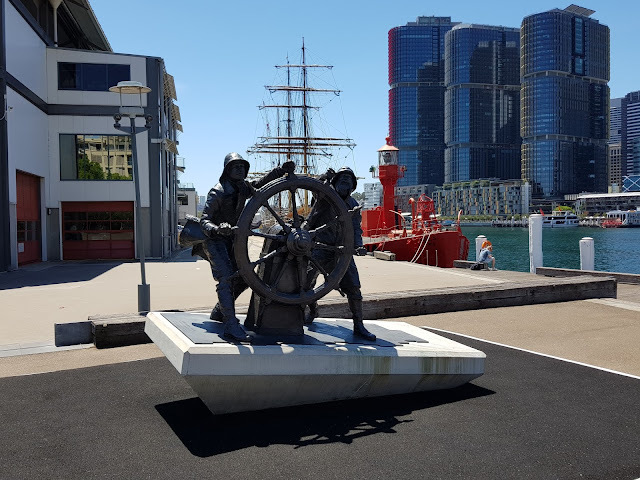 "Windjammer Sailors" is a bronze sculpture located outside the Wharf 7 Maritime Heritage Centre of the Australian National Maritime Museum at Pyrmont looking out on Darling Harbour. The work is based on a concept by Dennis Adams which was modelled by sculptor Brett Garling and unveiled in 2016. It pays homage to sailors in the 19th and early 20th centuries who often risked their lives in perilous weather to sail wind ships (windjammers) carrying critical cargoes in and out of Australian ports to foreign lands. The Commonwealth Lightship 4 Carpentaria is the floating unmanned lighthouse moored at the wharf and the International Towers at Barangaroo can be seen in the distance. It certainly is vividly rendered. The way the platform on which the statue is posed gives a suggestion of a boat rocked by waves, doesn't it? Nice art work. This statue is beautiful, and so fitting in the wharf. Sorry, getting back so late - in the next All Seasons you'll read why:) But nevertheless, a big thank you! ...Jim, public art is a great addition to a community. Thanks for sharing this sculpture, have a great week. A wonderful sculpture, and located in the perfect spot. I enjoyed seeing this treasure very much! Jim, Come all ye young fellows that follows the sea. Thanks for sharing.